Spring is finally here! How do you fancy creating your own supply of juicy fruits, crunchy vegetables and fresh salad greens? Growing fruit and veg is a popular, cost effective and productive way to use your garden although don’t let the lack of outdoor space stop you! Many varieties can be grown in pots, hanging baskets, raised beds or even in the flower border. Growing your own fruit and veg is fun and healthy. It’s also so rewarding! Nothing beats the taste of homegrown produce, from finger licking fruity strawberries to the flavour of green beans grown with your own hands. Here’s a selection of great crops that will need minimum effort and time to grow, together with some top tips. Salad is a brilliant vegetable to begin with if you have never grown anything before. It can be grown in a window box if space is limited and you can harvest outer leaves as you need them without pulling up the whole plant, so they can carry on growing and you can keep on munching. Make sure plants are well watered during dry spells though, especially those in containers. And look out for those hungry slugs and snails; try eggshells around your seedlings as slugs don’t like rough surfaces! Dampen the leaves you have picked with tap water and put them in a plastic bag or in a jar in the salad compartment of the fridge, if you need to store them for a little while. And to keep that summer crunch coming, sow seeds or young plants at regular intervals from spring to summer! Plant now in time for Wimbledon! 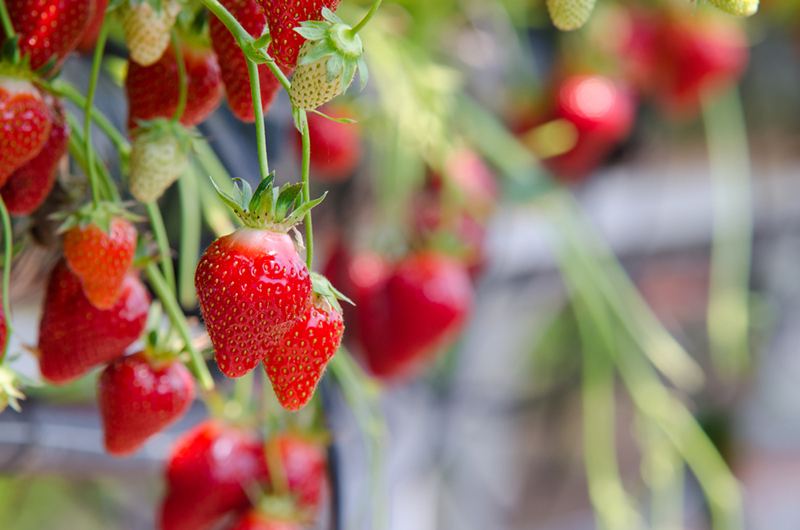 Strawberries are so versatile – they just need sun, shelter and fertile, well-drained soil. Pick strawberries when they are bright red all over, ideally during the warmest part of the day because this is when they are at their most tasty. Everybody loves strawberries but if your yield is getting too much for the family, why not add a few to smoothies, milkshakes or make some jam!? Avoid areas prone to frost and soils that have previously grown potatoes, chrysanthemums or tomatoes because they are all prone to a disease called verticillium wilt. Also avoid windy spots to prevent pollinating insects from reaching the flowers. New strawberry plants will need watering frequently until they are established. Also water during dry periods in the growing season. It’s best to water from the bottom as watering from overhead can rot the crown and fruit. A good way to avoid the strawberries from rotting on the soil once the fruits start to develop is to tuck straw underneath them! You can’t rival the flavour of a fresh home-grown tomato straight from the vine. But tomatoes need a lot of water and feed to get the best fruit. If you allow the soil or compost to dry out and then flood it, the change in water content will cause the fruit to crack. Water little and often for the best results, always aim to keep plants evenly moist. Start picking when the fruit is ripe and fully coloured. And at the end of the growing season lift the plants with unripen fruit and either lay them on straw under cloches or put them on your window sill to ripen. You can also turn them into chutneys or tomato jam! Red alert! To greatly increase your yield of fruit, remove all tomato “side shoots”. These are the shoots that continually grow at a 45º angle between the main stem and plant branches. Plants grown as bush or hanging basket types do not need to have side-shoots removed. Green beans (aka string beans or snap beans) are perhaps the second most popular home garden crop next to tomatoes. It’s easy to see why. The beans are relatively easy to grow and give off a good yield. Green fingers tip… A few weeks before planting beans, add plenty of well-rotted manure to the soil to improve fertility. If you are starting from seeds, they like warm soil and a full sun location. Don’t plant any seeds until all danger of frost has passed. Green beans also like well-drained and fertile soil, preferring soil that has not recently been planted with beans, potatoes, tomatoes, lettuce or cabbage. Water the plants directly at their roots to try and keep them as dry as possible. It’s also preferable to water in the morning to give plant leaves a chance to dry out, just in case! Harvest crops when young and tender and before you notice any bulge in the pod. If you cannot keep up with your yield, put your beans in jars with salt and boiling water and pressure can to preserve; or freeze your beans after blanching them for a few minutes. There are also some lovely pickled beans recipes out there! No matter what fruits or vegetables you decide to grow, once you start, it’s likely you’ll never stop. So whether you eat them fresh or choose to preserve them, enjoy the fruits (and vegetables) of your labour !